The .450 Bushmaster chambering proved a great fit for Ruger’s AR-556 MPR platform. Holt topped his with a Leupold Mark 4 2.5-8x36. Ruger is proving to be a great proponent of the .450 Bushmaster cartridge — and why not? 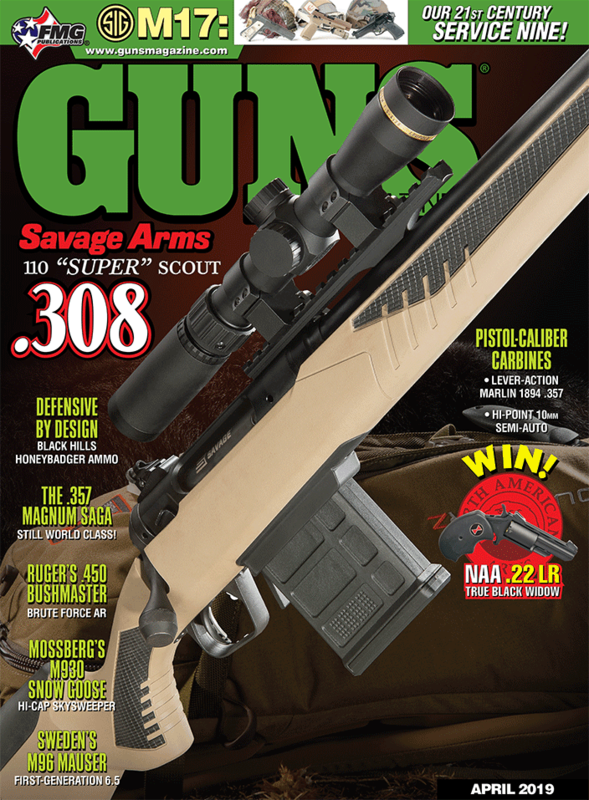 It’s a great tactical and hunting cartridge wrapped in a compact package. Having already chambered it in their American Ranch and Scout rifle lines for the cartridge, Ruger now offers the Bushmaster in their AR-556 Multi-Purpose Rifle. The cartridge was originally designed for the AR platform so all Ruger needed to do was create a new upper for their existing 5.56 lower and add a few refinements. The .450 Bushmaster is the product of a joint effort between the cartridge designers at Hornady and the AR makers at Bushmaster who wanted a big-bore cartridge capable of fitting in a 5.56mm-sized magazine and a standard AR magwell. What emerged was ingenious but I’ve come to expect such things from Hornady — they gave us another .45-caliber rifle cartridge two decades ago, the .450 Marlin, and are now riding high with the success of the 6.5mm Creedmoor. Lots of thump, less bump: Holt launches a couple of 250-gr. FTX bullets downrange. 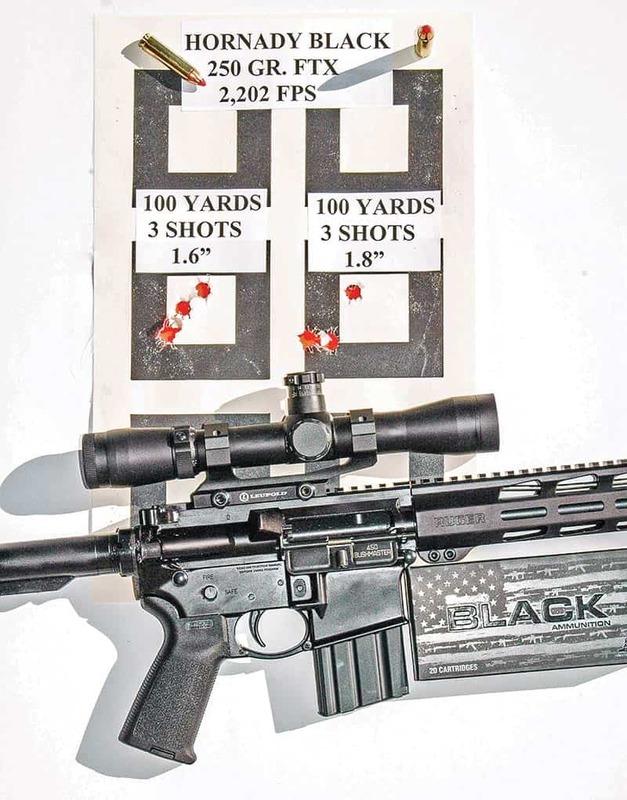 The current advantage of the .450 Bushmaster over competitors, like the .458 SOCOM or .458 HAM’R, is the Bushmaster’s SAAMI-standardized cartridge with specific dimensions and pressure standards. Not being a wildcat, it’s also widely available as a commercially loaded round. The .450 Bushmaster looks ever so much like a shrunken .45-70 or a stretched-out .45 ACP. It’s a straight case, measuring 1.70" and tapering from 0.500" at the head to 0.480" at the mouth. The rebated rim measures 0.473" — the standard dimension for the .30-06 family of cartridges. 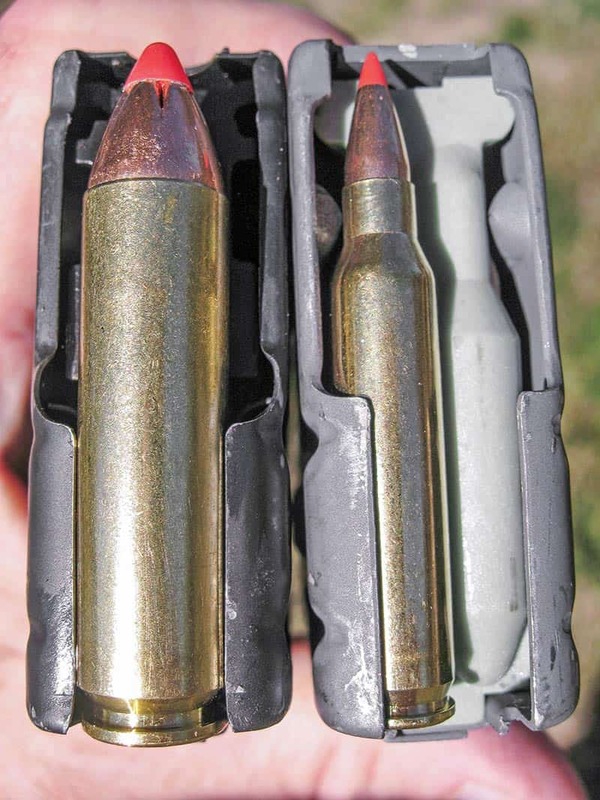 Like the .45 ACP, it headspaces on the mouth of the cartridge case so when handloading the round, you apply a taper rather than a heavy rolled crimp. Also like the .45 ACP, the bullet diameter is — surprisingly — 0.452 rather than 0.458". The case itself is designed for a small rifle primer which is understandable considering the power column is short and the recommended reloading powders are on the fast side of the burning curve. Hornady reports Hodgdon Lil’ Gun delivered the best overall velocity and accuracy. Other powders Hornady currently recommends are Accurate No. 9, H110, ENFORCER, Winchester 296 and IMR 4227. Small Rifle primers in this size case, burning fast powders, tend to deliver more uniform shot-to-shot velocities as well. Holt’s rifle proved to hold a consistent 1.5 MOA. It’s definitely accurate enough for big game hunting. Hornady’s bulletsmiths designed a 250-gr. FTX specifically for the .450 Bushmaster. It’s a polymer-tipped spitzer made without a cannelure. Loaded in their “Black” line with a velocity of 2,200 fps, Hornady considers the FTX loading to represent the perfect blend of accuracy and terminal performance. The “Black” loading is also the most common ammunition you will find at the store. My test was based on it, and it did deliver an average velocity of 2,202 fps from the 18.6" barrel of the Ruger AR. I consider it remarkable when the velocity of a factory load is claimed to be 2,200 fps and my chronographed results for 10 shots clock out at 2,202 fps. That’s truth in advertising! Interestingly, the ballistic chart Hornady prints on their box indicates a 200-yard zero, placing the bullet +4.1 high at 100 and -19.3" low at 300. I tweaked those figures a bit using Hornady’s own ballistic calculator. I chose a 175-yard zero which places the bullet +3.2 high at 100, +1.8 high at 150, -2.6 low at 200 and -10.9" low at 250. To me, this is a more realistic hunting zero. The .450 Bushmaster was specifically designed to fit in a 5.56mm magazine and a standard AR magwell. The medium-weight 18.6" chrome-moly barrel has a twist of 1:16, considered optimal for bullets weighing 170 to 260 grains. The muzzle is threaded 11/16"-24 and is factory fitted with a very effective muzzle brake. The furniture is Magpul. The lower receiver carries an MOE grip and a MOE SL adjustable buttstock. Perfect. The 15" free-floating handguard is slim, smooth to the touch and features M-LOK attachment slots at 3, 6 and 9 o’clock. Overall, the unloaded rifle weighs 7.4 lbs. with an overall length of 35.6" to 38.9" and an LOP from 11.1" to 14.4". I mounted a proven Leupold Mark-4 2.5-8x36mm scope on the rifle and headed to the range. There I loaded the magazine with five rounds and settled down at the bench. Accuracy? The final two targets pictured here are indicative of the level of accuracy I experienced. The rifle I tested is about a 1.5 MOA unit and that’s all the accuracy I need for shots on game out to 200 to 250 yards. The .450 Bushmaster cartridge would be effective on any species up to and including elk-size game. Unfortunately, there wasn’t any big game season when I had my hands on the rifle. If there had been it would have gone hunting. Big-bore ARs are a hoot to shoot and the thumpers have a unique appeal and impact all their own. The MSRP on this one is $1,099.